2 Bedroom Link Detached House Bungalow For Sale in Dukinfield for Offers Over £250,000. 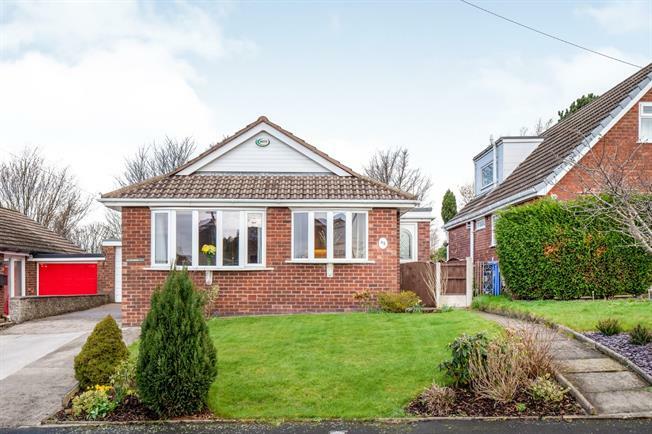 This beautifully presented link detached bungalow simply has to be viewed to appreciate the space and overall finish of the property. Extended and offering good sized rooms throughout the accommodation comprises of an entrance hall area, living room, kitchen diner, two double bedrooms and a fully tiled family bathroom. Driveway parking to the side leads to the integral garage whilst the spacious rear garden overlooks Gorse Hall which is great for those countryside walks. Viewings by appointment only. Double glazed door uPVC sliding doors opening onto the driveway with tiled flooring. Radiator, solid oak flooring, built-in storage cupboards and ceiling light. Double glazed uPVC bay window facing the front with additional window facing the side. Radiator, electric fire with surround, carpeted flooring and ceiling light. Double glazed uPVC front door with a double glazed uPVC bay window facing the front plus additional window facing the side. Radiator, heated towel rail and ceiling light. Fitted wall and base units with complementary wooden work surfaces, one and a half bowl stainless steel sink with drainer, integrated electric oven, gas hob plus overhead extractor. Integrated fridge freezer plus space for a washing machine. Double glazed uPVC patio doors opening onto the rear garden. Radiator, carpeted flooring and ceiling light. Heated towel rail, vinyl flooring, tiled walls, ceiling spotlights plus additional ceiling light. Low level WC, panelled bath and a pedestal sink. Driveway parking to the side for a number of vehicles leading to the integral garage which provides great storage space with an up and over door, electric and lighting. The rear garden is beautifully presented and overlooks Gorse Hall at the rear and combines a large lawned garden with a raised decked area all of which enclosed with planted borders, shrubbery and mature trees.